National Youth Council of Hungary organized its event on the 16th of May promoting active participatory democracy among the youth. The event was held in six university towns by different organizations and young activists. 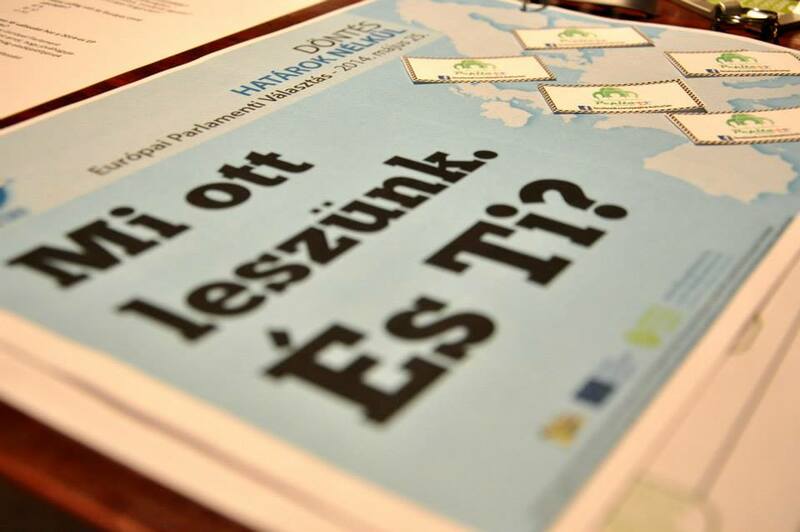 The project supported by Youth in Action Programme aims to involve the youth into decision-making processes with regard to the European Parliament elections 2014. The information platform provides independent facts and information related to the coming elections and the European Year of Citizens through its online campaign and events organized across the country. Online campaign of the project provides easily available information about facts or opportunities concerning their everyday lives. The project is supported by internationally recognized organizations such as the European Youth Council (YFJ) and the League of Young Voters (LYV) whose main objectives are to encourage the youth for voting and to provide a platform for those who have an opinion to send forward directly to the decision-makers. Your opinion can have an impact on shaping a policy, so do not hesitate to visit the official website of this politically independent initiative! Let’s have a debate, a party, AND go vote! The main objective of the event organized in six locations (Veszprém, Győr, Szeged, Pécs, Miskolc, Debrecen) is to make young people be aware of the importance of the coming European Parliamentary elections. The project is the result of the collaboration of the National Youth Council of Hungary and the Foundation for NGO's at the University of Veszprém which prepared a great show before the elections to convince young people to cast their votes on the 25th of May. The organizers did their best to bring the festival feeling to the six university cities mentioned above. Formal programs - such as the discussion forum entitled as “Voting is a right or a responsibility?” promoted the importance of active citizenship where participants could discuss their opinions with each other. In addition, initiatives shaping different communities got an important role as well, as they make serious efforts to increase the number of young voters. Visitors had to build the “wall of transparent decision-making,” to which they could paint or write their opinions. But other alternative methods played an important role as well such as the slam poetry corner, where performers used this popular genre to express their views regarding the elections. Proclaiming their views and their expectations in the future, young voters could take a photo before the wall of transparent decision-making demonstrating their voting intention. These interactive games, the involvement of the widest audience possible and the use of social media served the increase in the number of young voters. After the activities during the day, Voters Party! attracted young people to join. Local performers invited to the party guaranteed the cultural entertainment and paid attention to the importance of voting again. After that, you have nothing to do but writing the date of 25th of May into your diary and go vote! Do not forget that the future is in your hands; do not let others make a decision on your life instead of you!